In Hungary you pay with Forint (Ft). For getting the Forint in cash you should remind a few things. Not anything has to be paid in Cash and not always a Credit card. is the best choice. At some locations you also have the possibility to pay with Forint or directly with foreign currency, primarily with Euro. For emergency cases it is always advisable to have a payment alternative at hand. Who don’t know the Hungarian money up to now, should have a look at the last paragraphs of this article or at my German explanation. For paying higher amounts mostly a credit card is advisable. All larger hotels, petrol stations and superior restaurants accept all major credit cards. The exchange is calculated at the official cardholder currency billing code of the day. Additionally your particular credit card organisation charges an individual fee, so that the overall costs for the exchange amounts to about 1-2%. In most cases card payments give you the best exchange rate. Furthermore your cash within your vacation fund is preserved. This will be needed for situations, when card payments are not accepted. Hungary is mainly a cash economy. In rural regions, Csárdas or at street hawkers it’s not working anything without cash. 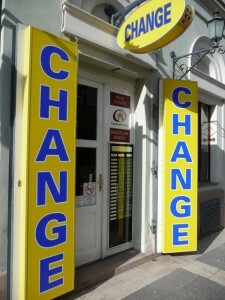 While foreign exchange offices sometimes are scarce in other countries, currency exchange in Hungary usually is possible without problems. That is true not only for touristic regions, but also for others cities and areas, because the Hungarians often holds a part of their deposits in other currencies. Nearby touristic attractions and sights usually there are foreign exchange offices with eye-catching advertising which are hard to miss. Besides Hungarian names like Penzváltó, Valutaváltó or Valutaeladás usually Change is written very large. The adjacent picture shows a typical foreign exchange office in Budapest nearby the St.-Stephens basilica. Inside of larger supermarkets like Tesco or inside other large shopping centres the visitors often can find a foreign exchange office too. When driving by car to Lake Balaton via Austria you can change money for example at the city ring of Sopron nearby the border to Austria. You should combine this with a short city walk there, because Sopron is well worth seeing. In Budapest there are advisable foreign exchange offices for example at the beginning of shopping mall Vaci utca nearby the bridge Erzsébet híd (but not in this street), nearby St.-Stephens basilica or nearby the western railway station (nyugati paludvar). Offices of Exclusive change usually have fair conditions. Hint: Be careful at the Budapest airport. Foreign exchange offices and also cashpoints/automatic teller machines (ATM) often offer bad exchange rates there. You should change only a very small amount there. Besides airport shuttle bus and taxi (Fötaxi) usually can be paid by card and then it is better to change the money in the city. Hint: Always check the quotation board at first und look for fine printed details about possible further fees. Then try a money exchange with a medium amount of about 100 to 200 Euros/Dollars or Pounds. If the final amount after subtracted fees is okay for you and you need more cash, you can exchange the total amount you want at this place. Depending on the foreign currency a difference of about 2-3% to the official average exchange rate is a fair deal for Euro, Dollar and Pound. Hint: Try to avoid the overpriced foreign exchange offices at the Buda castle hill. Instead of that here you can withdraw cash at a cashpoint, for example at the backside of Hilton hotel right beside the fisherman’s bastion. With a Maestro card (former EC card) you can withdraw money at a cashpoint (ATM) in Hungary as easy as in your home country or other European countries. When inserting the card the cash machine detects the foreign origin and presents you a language selection at first. After changing to English the procedure is mainly as you know it. But always take care to withdraw the desired amount in the local currency Forint and not in Euro or Dollar or other currencies. In most cases the offered conversion gives you a much less favourable rate. Besides as usually an additionally fee for third-party banks is payable withdrawing small amounts is uneconomic. Preferably withdraw a larger amount at one, for example 100.000 Forint (about 330 Euro or 370 Dollar). Clients of Unicredit partner banks possibly can withdraw money without fees at several branch offices of Unicredit, for example at Szabadság tér in Budapest. Please check the validity date of your card(s) before starting your journey. Some shops and merchants also accept Euro as means of payment. Only in some cases you may pay also with Dollar or Pound directly. At first sight this seems to be convenient, but on closer inspection sometimes this turns out to be an expensive service, because the used exchange rate might be noticeable below the cash exchange. Inside supermarkets like Tesco the currency exchange usually would be fair. To avoid calculating and for simplicity it is advisable to prefer the payment with Forint. For your vacation it is recommendable to have a cash emergency reserve at hand, if the planned means of payment get lost for any reason. This reserve can be a separately stored card, cash money in Euro, Dollar, Pound or many other currencies and also traveller’s cheques. – Forint currency cash exchange / currency purchase outside Hungary: In Hungary it is always cheaper and much easier to find a foreign exchange office. – Currency exchange at mobile street vendors: you might become a victim of a trick swindler or get some counterfeit money or obsolete money. – Accept obsolete money: obsolete banknotes of 200 Ft are invalid for merchants since 2009 and at banknotes of 1000 Ft you should pay attention, that the wider hologram stripe of the newer edition is contained. Present Forint coins are minted bicolored (see below). Hint: If you are driving by car you should always save some coins and have them at hand. Parking fees are often about 300 Ft per hour, for which you need always several coins at the machine. If you plan to come back to Hungary, you should save some cash for your next visit. Then you don’t need to look for a foreign exchange office immediately. Besides repeated money exchange costs unnecessary fees. Forint bank notes are in circulation with nominal values of 500, 1.000, 2.000, 5.000, 10.000 as well as 20.000 Ft. This means a range of about 1,70 Euro up to 70 Euro or $1,90 up to about 80$..
– 500 Forint: the reddish brown coloured bank note shows prince Ferenc II. Rákóczi and the Rákóczi castle in Sárospatak on the rear side. This is the only valid bank note without a hologram stripe on the left side. – 1.000 Forint: this pale blue bank note shows King Matthias (Mátyás Király) and the Herkules fountain of Visegrád on the rear side. Depending on the year of issue the hologram stripe maybe coloured coppery or silvery. Older issues of this bank note are looking nearly identical, but are missing the hologram stripe. Usually bank notes of this kind are accepted not more. Until august 31st 2027 they can be exchanged at the Hungarian national bank. – 2.000 Forint: this bank note is designed with sallow brown and shows the prince and commander Gábor Bethlen. On the rear side he is shown together with scientists. 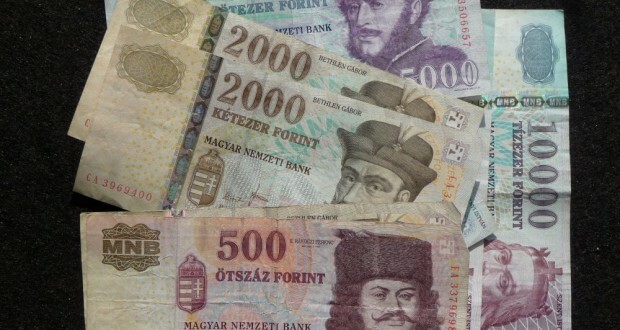 – 5.000 Forint: On this bank note in turquoise and purple the state reformer earl István Széchenyi is pictured. The rear side shows the homonymous castle of Nagycenk. – 10.000 Forint: this bank note presents the national saint and founder of Hungary king Stephen I. (Szent István Király). The rear side gives a view over Esztergom with the large Basilica. Starint from 2014 there is e newly designed version of this bank note in circulation which offers more security features. – 20.000 Forint: this bank note with the largest value presents the politician Déak Ferenc, who arranged the balancing between Austria and Hungary in 1867. The rear side is decorated with the old government building form the Pest side of the city. More detailed information about all presently valid Forint treasury notes together with their respective security features gives two brochures of the Hungarian national bank in English. 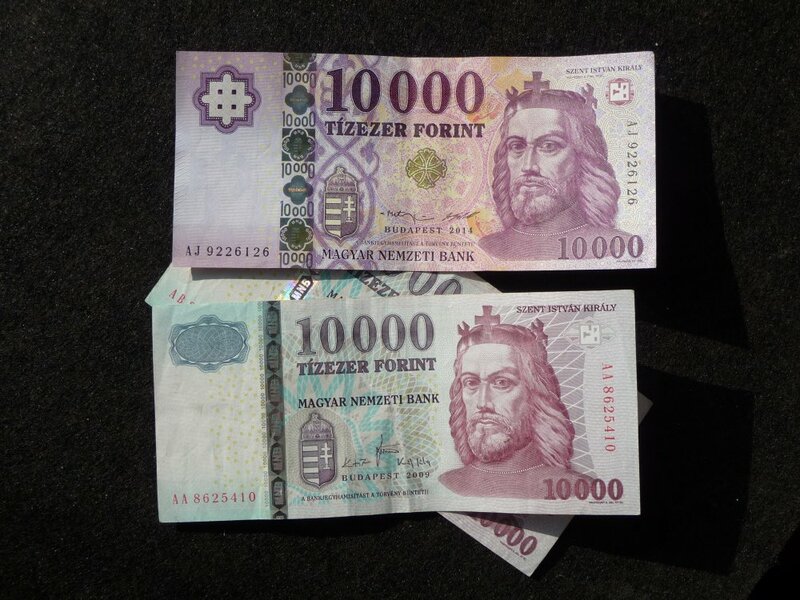 The first one http://www.mnb.hu/letoltes/forint-fuzet-en-2014.pdf informs about all bank notes from 500 up to 10000 Forint. The second one http://www.mnb.hu/letoltes/ft-fuzet-2015-en.pdf explains the reworked bank note of 20000 Forint. Presently circulating coins have denominations of 5 Ft, 10 Ft, 20 Ft, 50 Ft, 100 Ft and starting from 2009 also 200 Forint. 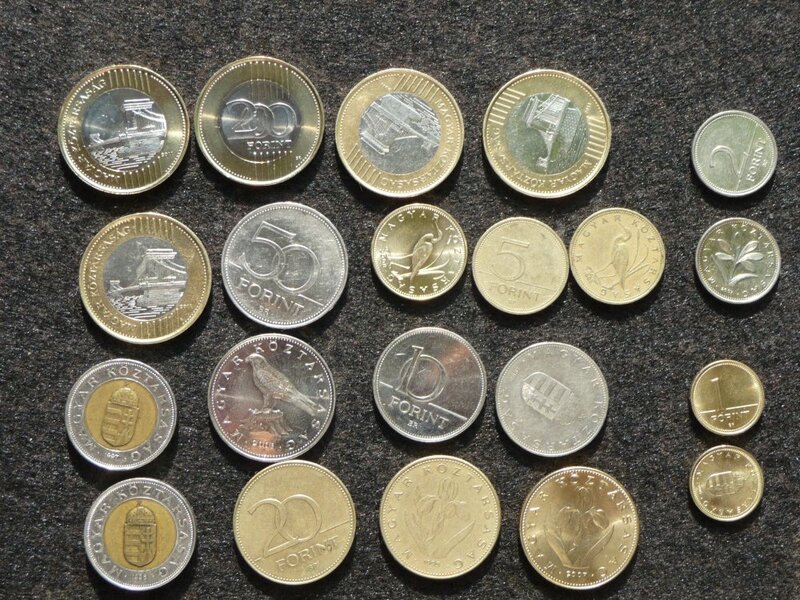 The formerly usual subdivision of Forint into 100 Fillér theoretically exists, but because of the very small value all Fillér coins are out of circulation since 1999. Since 2008 the same applies also to the coins of 1 Ft und 2 Ft. Starting from 2012 they cannot be exchanged anymore and might by only a souvenir. Prices in the supermarket are still given for one Forint, but the total amount is rounded up to the next value which can be divided by 5 Forint. – 100 Ft: this coin presents the Hungarian coat of arms with y yellowish inner area and a nickel-coloured outside section with finely-ridged edge. In contrast to other coins this one consists of steel with a coating of nickel and brass respectively. – 50 Ft: this nickel-coloured coin has a smooth edge and shows a falcon. – 20 Ft: on this yellowish coin with finely-ridged edge a Hungarian iris is reproduced. – 10 Ft: this nickel-coloured coin again shows the Hungarian coat of arms. – 5 Ft: this yellowish one is the smallest coin with smooth edge and showing an egret. The very old bank notes were marvellously designed, but are out of circulation more than 20 years. The smaller ones from 10 Ft to 100 Ft only have a collector’s value. Larger bank notes from 500 Ft up to 5000 Ft can be exchanged at the Hungarian national bank until 2019. The green bank note of 200 Forint might be still offered to someone, but this is out of circulation since 2009. If you get one or find such a bill in your wallet from an earlier trip, this only can be a nice souvenir. More detailed information about all coins and bills out of circulation gives the Hungarian national bank on their webpage. All withdrawn coins you can find at http://www.mnb.hu/en/banknotes-and-coins/coins/coins-withdrawn-since-1946. Completely withdrawn banknotes you find at http://www.mnb.hu/en/banknotes-and-coins/banknotes/banknotes-withdrawn-since-1946. And the page http://www.mnb.hu/en/banknotes-and-coins/banknotes/exchangeable-banknotes-withdrawn-from-circulation informs about withdrawn banknotes which still are exchangeable. Also guests from the former sister country GDR had to take some hurdles for getting the Forint, because the exchange at the rate of 1:6 at that time was limited for citizens of the GDR to a maximum amount of 2650 Forint yearly. The fixed day rate amounted to 31 Mark of the GDR. Additionally there was possibly a qualification certificate for exchanging another 100 East-Mark. The webpage http://www.herbst89.info/index.php/inhalte-ungarn/173-goulaschkommunismus is telling more details about this in German. Does someone has further tips and recommendations or did make bad experiences? Would you like to read more articles in English language on my primary German webpage here? Comments are welcome on my blog.